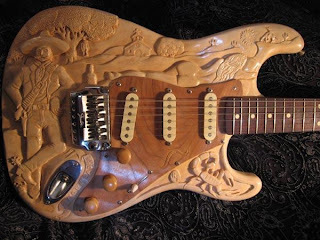 Carver Bob Ironside is a fixture within the Myspace guitar community. He do like to whittle... just a little, and he calls this one "Zappata-Caster". I call it The Wood, The Bad and The Lovely. 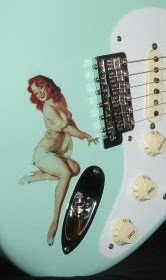 One of his unbelievable headstocks is profiled in an earlier post. Click the image to visit Carver Bob's site, where you will experience more works by a man who can whittle like nobody's bidness.